As a kid, I always thought the Allosaurus was much cooler. For one thing, it was on the cover of my favorite dinosaur book, “The How and Why Wonder Books of Dinosaurs“. Along with a Pteranodon, Rhamphorhynchus (thanks for the correction, Charlie), making it one of the three most important dinosaurs, ever! 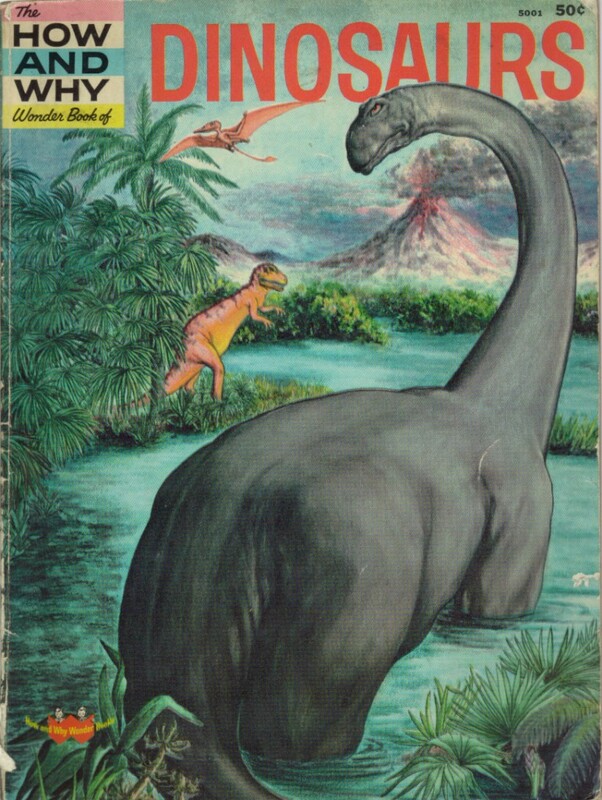 Admittedly, the third was a Brontosaurus, a dino shown to be not extinct, but never to have actually existed. But for some reason, Spielberg thought that the T. rex was cooler than the Allosaurus, and featured it as the terror-du-jour in Jurassic Park. (Jurassic? Allosaurus lived during the Jurassic. Rexie lived in the late Cretaceous, some 90 million years later). 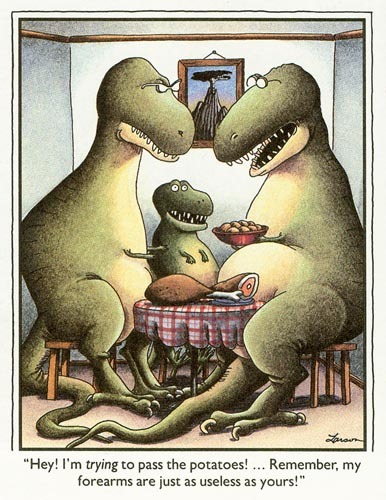 The lack of credibility of his choice is apparent, as ol’ rexie was cast alongside large Velociraptors. The real Velociraptor was the size of a goose, and with feathers & all probably looked a bit like one, albeit with teeth and a long tail. But it’s hard to terrorize your audience when Jeff Goldblum is being chased by a pair of honking toothed geese. 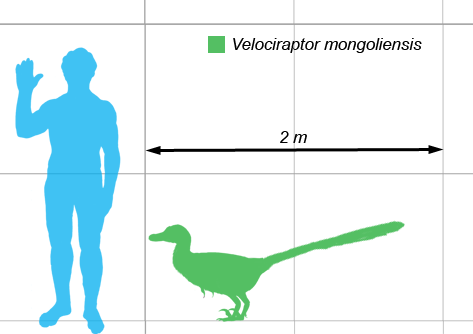 …palaeogeneticists led by Morten Allentoft at the University of Copenhagen and Michael Bunce at Murdoch University in Perth, Australia, examined 158 DNA-containing leg bones belonging to three species of extinct giant birds called moa. The bones, which were between 600 and 8,000 years old, had been recovered from three sites within 5 kilometres of each other, with nearly identical preservation conditions including a temperature of 13.1 ºC. So the researchers actually had a good timeline with which to estimate the half-life of DNA. To physically do it, they tried to amplified a 242bp segments of mitochondrial DNA using standard primers from Moa of different ages. They proceeded to amplify DNA the recovered from differently dated bones, and determined that the DNA degraded by first-order kinetics (kinda, see below), and the half life of the moa mtDNA as k=521 years. So how much can we hope to recover from the Allosaurus? Since dinosaurs are really birds (or vice versa) we can assume bird-size genome, say 1074 million bp (I’m basing this on Chicken). After t=150 million years we would only have Nt = 1.07×109 x e–kt which leaves us basically with, um, nothing. There goes my Allosaurus army. Sniff. Categorized under: Books, Comics, Evolution, Linux, Taxonomy. Tagged with: dinosaurs, evolution, Paleontology, Science, Unix. Interesting article. Not to nitpick, but I think that’s actually a Rhamphorhynchus on the cover of the “How and Why Wonder Book”, not a Pteranodon. I also remember the wonder book fondly from my childhood.